Spider-Man is best as the underdog. Against the unstoppable Juggernaut, yeah, he’s very much the underdog. In The Amazing Spider-Man #229, Juggernaut pursues the psychic Madame Web, and only Spider-Man is available to come to her aid. But he’s totally ineffectual against an invulnerable opponent who’s as strong as the Hulk. He seeks help from other superheroes, but they’re all out of reach (conveniently for the story, inconveniently for Spidey). It’s all on him. He tries. He fails. But for Spidey, failure is motivation. Someone was counting on him, and he let her down. That hits hard, especially given his previous failures in life. So he picks himself back up and resolves to capture the Juggernaut, no matter the personal cost, and issue #230 shows Spidey giving it all he’s got until he prevails. It’s a great structure for a two-parter. The hero fails, regroups, and perseveres, because like hell he’s failing again. A textbook example of a superb superhero story. This entry was posted in comic books, Today's Super Comic and tagged Amazing Spider-Man, John Romita Jr., Juggernaut, Madame Web, Marvel, Roger Stern, Spider-Man on May 1, 2017 by drsherrier. 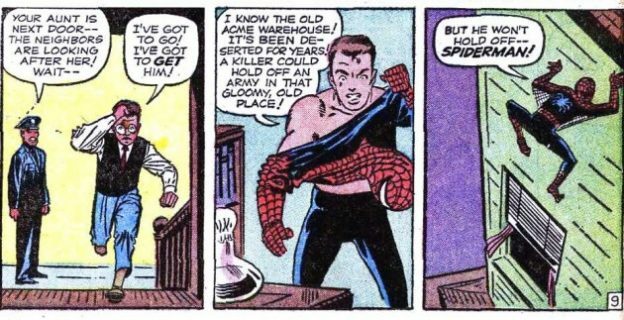 Yesterday I discussed when main-continuity Aunt May discovered Peter Parker’s secret identity. Now let’s turn our attention to the Ultimate continuity, when Peter told Mary Jane. This is basically the inverse of yesterday’s revelatory issue. Ultimate Spider-Man #13 was very early in this Spider-Man’s career, so no secret-identity tensions have been building up over the course of years. Peter and MJ are teenagers who have been friends for a long time, and Peter proactively reveals his secret because he doesn’t want to lie to her (and, being a teenage guy, he no doubt wants to impress his closest female friend). But like yesterday’s issue, this entire comic is a conversation. The action and adventure take a break, allowing us to zero in on the characters—which will help us care about them more when the action/adventure commences again. Comics aren’t supposed to feature talking heads, but this one works remarkably well because of Brian Michael Bendis’s writing and Mark Bagley’s art. The page layouts are key here. The panels are used to punctuate each beat of the conversation, allowing everything to flow smoothly and organically. The reader gets an excellent sense of the pacing and timing of everything that’s being said. And Bendis knows when the keep quiet and let Bagley show the characters’ reactions so that even with the focus on dialogue, it remains a visual experience. It’s a rather happy issue (and funny in places), providing a nice break from the angst, and it deepens the bond between two main characters. 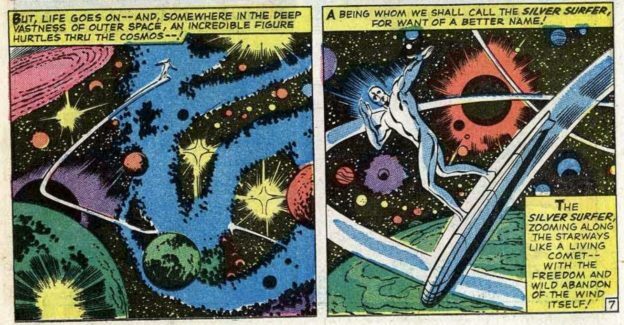 It also does what every teen superhero book should—it captures that wonderful anticipation of exciting new possibilities. This entry was posted in comic books, Today's Super Comic and tagged Brian Michael Bendis, Mark Bagley, Marvel, Mary Jane Watson, Peter Parker, Spider-Man, Ultimate Spider-Man on April 5, 2017 by drsherrier. Aunt May discovers that her nephew Peter is Spider-Man—which means he’s been lying to her for years. It’s the sort of thing that requires setting aside some time to chat…perhaps an entire issue to chat. The Amazing Spider-Man #38 (or #479, since the cover plays it both ways) features no super-heroic action whatsoever. It’s just Peter and May talking. Between all the history behind the conversation and how well J. Michael Straczynski writes it, it’s engaging throughout, full of emotion rather than melodrama. Both characters have been holding secrets in, and the release is scary, relieving, and scary all over again. A nice touch is how much credit the story gives Aunt May. She had often been portrayed as elderly and frail, but here Straczynski gives the impression she’s a remarkably resilient old lady, and she would have to be to single-handedly raise a teenager after her husband’s murder and in the face of repeated health problems and financial troubles. The issue doesn’t reach any tidy resolution. There’s no happily ever after—there’s just moving forward. Straczynski had a memorable run on Spider-Man a few over fifteen years ago, and this was the best thing he did with the book. It needed to happen (though I’m pretty sure it was retconned along with Peter and Mary Jane’s marriage, alas). This entry was posted in comic books, Today's Super Comic and tagged Amazing Spider-Man, Aunt May, J. Michael Straczynski, John Romita Jr., Marvel, Peter Parker, Spider-Man on April 4, 2017 by drsherrier.